Homeowners and business owners in Alpharetta who are in the market for retaining wall products can trust Alliance Stone for all of their Alpharetta retaining wall products, retaining wall supplies and retaining wall stones and blocks. If you are in the market for high quality stone retaining wall supplies for an upcoming project, Alliance Stone is your one stop shop. As the premiere choice for Alpharetta retaining wall products, Alliance Stone takes pride in supplying and providing the best of the best when it comes to quality landscape and retaining wall materials. Retaining walls come in all shapes and sizes, and no matter the size of your retaining wall job, Alliance Stone has the products for you. High quality natural stone, modular block, flagstone, stack stone and field stone are just a few of the Alpharetta retaining wall options for you to choose from at Alliance Stone. With years of experience and knowledge in the stone industry, the expert staff at Alliance Stone can guide you to choose the perfect fit of products and supplies for your retaining wall project. Whether your retaining wall project is primarily to add dimension to your yard or if your landscape needs a retaining wall for drainage or erosion problems, our quality retaining wall materials will be just what you are looking for. Stone is an excellent choice for retaining walls, as its natural sturdiness and durability will outlast many other material options. Stone will not rot or decay, and if your retaining wall is built properly, a stone retaining wall can last a lifetime. In addition to supplying all of your Alpharetta retaining wall products for your upcoming job, Alliance Stone has a vast selection of retaining wall accessories like grids, mortars, polymers and adhesives. Contact our Alpharetta Retaining Wall Product Specialists today and inquire about our delivery options as well as direct shipping. 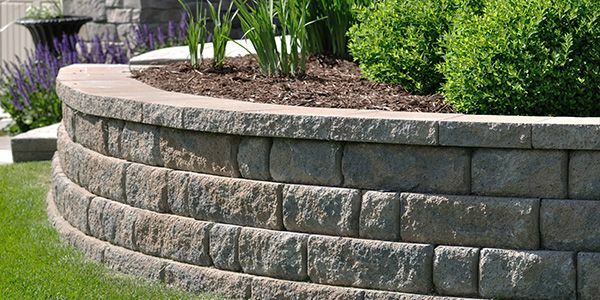 At Alliance Stone, we look forward to being your solution for all of your Alpharetta retaining wall product needs!